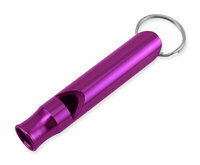 Anodized Metal Whistle is durable and able to hold up to children playing, as well as adult's pockets, backpacks, or purses. Easy attachment with a 20 mm split ring. Fun for kids, and smart for adults! Perfect for hikers and campers, these whistles draw attention to any crisis. This highly attractive toy is also available in teal, blue, and black. Anodized metal alloy. Pantone Purple 2602 C. Size 2.5" x 0.5". Packaged in individual PVC box.